Motorcoach operator relies on Samsara data to inform all aspects of their business, from safety and customer service to fleet maintenance and payroll. Vehicle gateways, dash cameras, and temperature monitors provide real-time visibility into the fleet and conditions on the ground. Engine fault code alerts and electronic DVIRs streamline fleet maintenance and ensure that vehicles are safe for passengers. Open APIs make it easy to sync fleet and driver data into other applications. 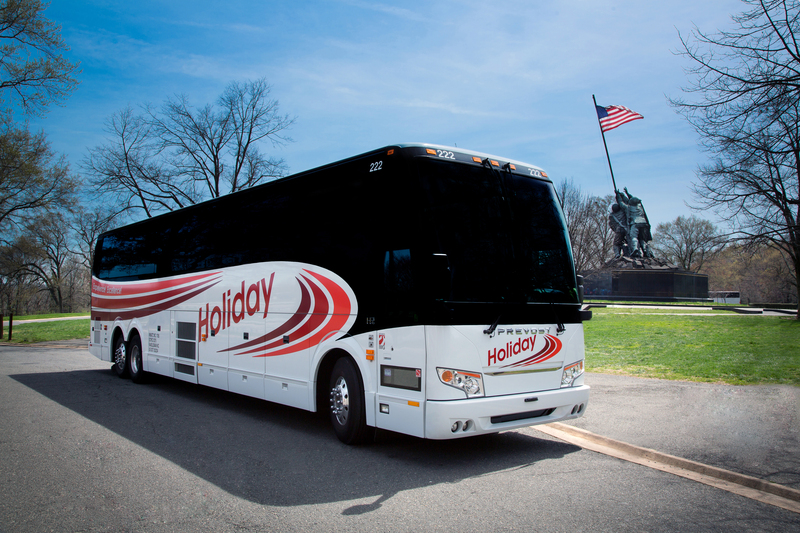 Holiday Tours, founded in 1978, is a family-owned-and-operated charter bus company based in North Carolina. The company runs a fleet of 74 motorcoaches and specializes in private charter services, as well as preset tour packages. 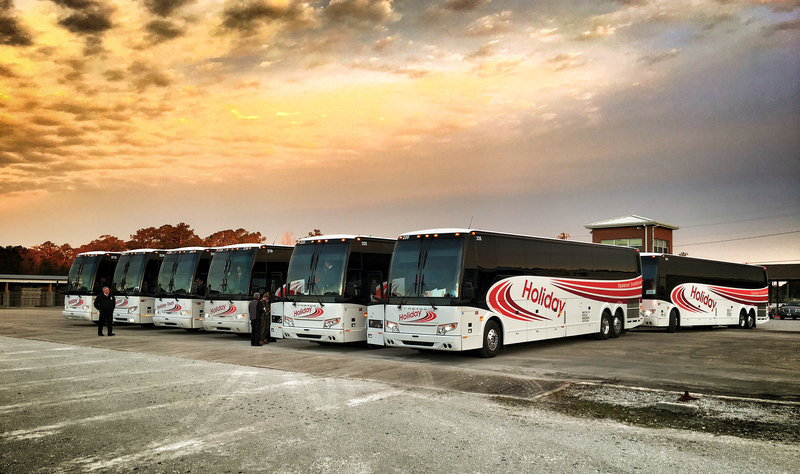 Holiday Tours prides themselves on the level of service they provide to customers, the company’s safety record, and their track record of innovation. From the beginning, Holiday Tours recognized the importance of using technology in their fleet operations. Because there wasn’t bus-specific software in the 1980s, the company decided they would build one themselves. Their system helps them manage numerous aspects of their business, including customer reservations and quotes, scheduling, maintenance, accounting, and HR. What they were missing, however, was a way to pinpoint where their buses were. When General Manager David Moody deployed Samsara vehicle gateways, he was excited to add GPS tracking to his fleet and quickly realized the value of real-time tracking. Safety is Holiday Tours’ top priority as they strive to offer their passengers the best possible vacation. The company has extensive policies and procedures in place to provide their customers with a safe trip and protect everyone on the road. The team had started out with a camera system that would collect harsh driving events and send them in a large batch during the evening. They were pleased to discover that Samsara let them see harsh driving events as the incidents happened throughout the day. This allowed Holiday Tours to get instant feedback on driver behavior and see what customers were experiencing. Soon, the company wanted even more context around each incident and invested in Samsara dual-facing HD dash cams to get a full picture of what was happening on the road. "Owning the data ourselves is very important, and Samsara gave us full access to the data." With dash cams, Moody has also been able to exonerate his drivers in two incidents and save thousands of dollars in insurance claims. Going through that process gives him confidence that Samsara data on driver behavior and dash cam footage will be able protect his drivers and business in future situations. Motorcoaches require regular maintenance to deal with diesel particulates through a process called regeneration. Not performing regeneration on an engine in time can actually cause the vehicle to stop in its tracks. Samsara’s fault code alert has been able to notify the team when regeneration is needed even before the bus dash indicator lit up. To keep on top of maintenance needs and ensure a safe riding experience for customers, Holiday Tours requires DVIRs at the start and end of every day. With the Samsara Driver app, the team can perform DVIRs on any smart device, which enabled them to move from paper to a fully electronic workflow. Electronic DVIRs and fault code alerts save the team at least 10 hours a week, decreasing their response time for maintenance issues or schedule changes and helping the company operate more smoothly. Samsara data helps Moody run the business more efficiently and gives the Holiday Tours team visibility across their operations. Having everything in one place enhances their ability to make decisions that improve their customer service. Today, Moody relies on the Samsara API to pull real-time data into Holiday Tours’ custom platform to always have the most up-to-date information for the team. He is able to populate payroll records with driver HOS data, driving hours, mileage, and trips taken to calculate compensation. The company even pays a premium for certain times of day, and Moody is able to get that level of granularity directly from Samsara. Moody also pulls electronic DVIR information directly into their maintenance work queue so they can take care of and account for every service issue. This ability to bring Samsara fleet and driver data into the Holiday Tours' backend system gives the team the level of customization they need to provide the best experience to their customers.